Now that I'm living in a mild climate that is also known for its higher humidity levels in the summer months, I decided I'd like to give mushroom cultivation a try. Since we don't normally have freezes during the winter months mushrooms should have a good time growing here. We do get a hard frost here and there but it's not the norm to have a frozen winter in SW Florida which is why I am here and not in SW Montana! 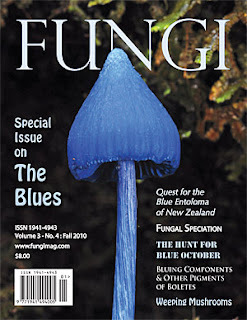 The mushrooms I've decided to grow are Shiitake, Lentinula elodes, Maitake, Grifola frondosa, oyster mushrooms, Pleurotus ostreatus and Lion's Mane, Hericium erinacius. These species will all grow on oak which is the type of wood host I have to use since there is tons and tons of oak in Florida. Hardwood species are required for these. My friend had to cut a huge limb off his oak tree so I asked him to save me some logs about 3-4 feet long and no bigger in diameter than 14". Once the logs have been cut off a living tree, they need to rest for two weeks to a month prior to plugging. You must make sure the logs are not in contact with soil while they are resting. Also winter trees have more sugar content in them so it's best to cut the logs in the winter if possible. Once you have your rested logs you will need your mushroom spawn which comes in the form of a wooden dowel or plug. The spawn is inoculated into the plug. There are several sources for purchasing these spawn plugs. I got mine from Fungi Perfecti in Olympia, WA. The next step is to drill holes into your logs in a diamond pattern around the circumference of the logs having all the holes no more than 4" apart. The idea here is to have enough spawn plugged into the log that the spawn will take over (colonize) the entire log in time. A 3-4 foot log can take 50 or more plugs. Insert the plug into the hole and pound in with a rubber mallet. After you have your logs plugged, you need to seal the plugs with a coating of cheese wax to prevent micro organisms from contaminating your mycelium. Once all the logs have been plugged they need to be stacked in a damp and shady location to rest, off the ground on a pallet, stacked in a criss cross pile called a "rick" to help conserve moisture. Cover the rick with shade cloth or a tarp and keep cool and damp. It is important that sufficient moisture is maintained to support the mycelial growth. Now that your logs are plugged, covered, watered and tarped, the next step is to wait. This step is referred to incubation which will take 6-12 months for the mushroom mycelium to colonize the logs. Now is the time to walk away and just ignore them. We will discuss fruiting later when the time comes, so stay tuned. 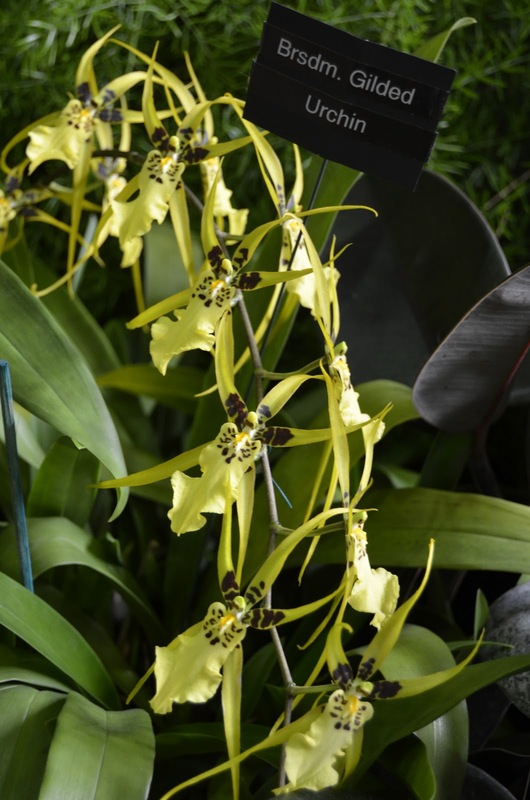 Who doesn't love orchids? I know people think they are very difficult to grow but really, most of them are not that difficult with the right light. Phalaenopsis are the easiest and I think paphiopedilum are not too difficult either to grow and get to bloom again. The tough guys are cattleyas which are much more temperamental and like being outdoors in warm tropical climates. Now that I have a home in FL, I will try my hand once again at growing these corsage orchids outdoors. I've been told all you need to do is tie or hang them from a tree and squirt water at them once in a while and they will bloom! I'm not sure how correct that is, but I'm willing to give it a try. 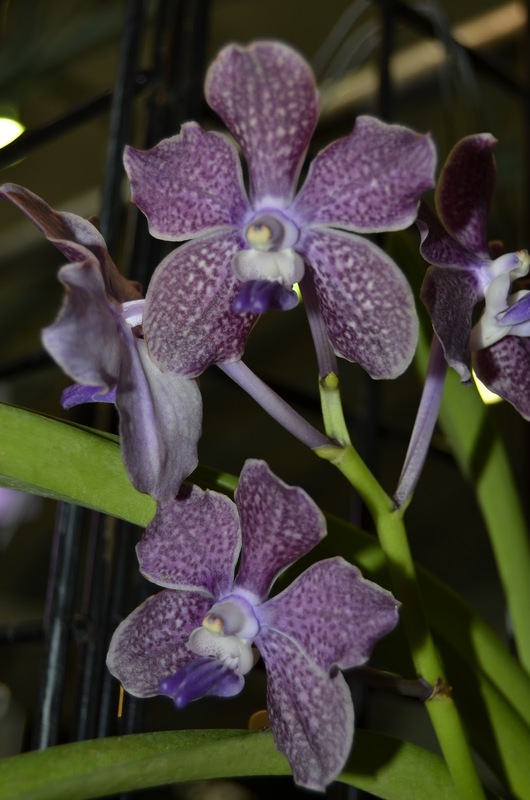 This morning was the opening of the first day of the big Sarasota Orchid Society Orchid Show and Sale. I, of course, was the first paying customer in the door! That made it easier to shoot photos of the gorgeous orchids in the show and also get to the sale tables before they got massacred. Here are some photos from the show. Enjoy!